On 5 July 2017 the Queen formally opened Scotland's newest section of canal, the Queen Elizabeth II Canal. This formed the very last piece of the Millennium Link, a project costing over £80 million in total that restored central Scotland's inland waterways to full use after over half a century of abandonment. Amongst the highlights of the project was the construction of the iconic Falkirk Wheel, which was opened, also by the Queen, in May 2002. Until the building of the length of new canal, which takes eastern end of the Forth and Clyde Canal to its original starting/ending point of Grangemouth, vessels entering or leaving the canal did so via a loch linking a canal basin with the River Carron, in the shadow of the M9 motorway. The new length of canal gives the whole project a rather more fitting gateway. 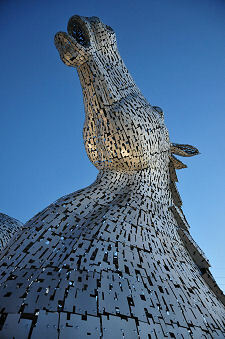 This page, however, carries the title "The Kelpies". Why start with a discussion of Scottish canals? The Kelpies are two magnificent 30m high steel horses' heads that were built in 2013 and stand beside the canal basin previously forming the end of the Forth and Clyde Canal, and beside the M9 motorway. They were erected in 2013 and have become as iconic in their own way as the Angel of the North since its completion on a site beside the A1 in Tyneside in 1998. When we first tried to find the canal basin, in 2003, access was - we eventually discovered - via a length of unassuming single track road from an industrial estate close to Junction 6 on the M9. Boats and canals are always attractive, but the idea that this post-industrial landscape could be turned into something of real community value seemed frankly rather unlikely: still less that it could become so popular that parking could be an issue at busy times. It just goes to show what can be achieved with vision and commitment, and quite a lot of very well spent Lottery money. 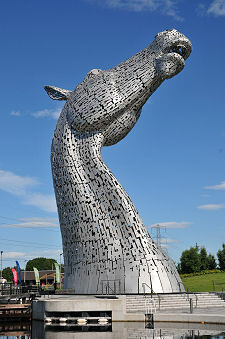 The location of the Helix and the Kelpies is today very well signpost from any approach into Falkirk, and access is from a roundabout on the A9 as the road skirts around the northern side of the town. The access road least you past a parking area for Helix Park children's playpark and a boating lake, and on to the core of the park. From the main parking area there is a nice approach to the Kelpies themselves along a path that runs for a couple of hundred yards beside the Forth and Clyde Canal. It is an indication of how successful the Kelpies have been in drawing people in that the area now boasts an impressive visitor centre and a range of other facilities. 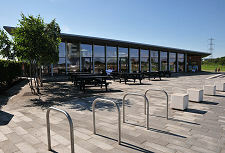 The visitor centre sells tickets for guided tours (which include an interior view of one of the Kelpies), and offers a shop and an exhibition area. 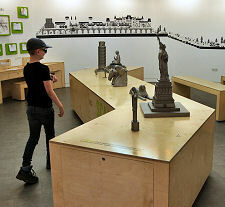 The highlight of the exhibition area is a series of same-scale models of major attractions around the world showing how the Kelpies stack up in terms of relative height. 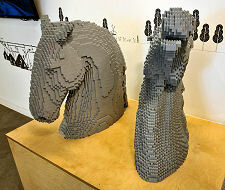 There are also some nicely-constructed Lego models of the Kelpies on show, and the opportunity for young visitors to flex their own creative potential with Lego. 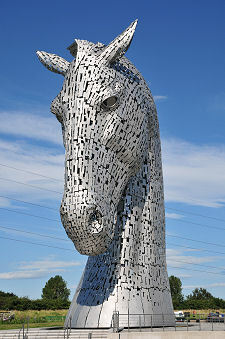 The visitor centre has its own cafe, and there is additionally the "Artisan Grill" between it and the Kelpies themselves, offering everything from cooked food to ice cream; while at the northern end of the site is the "Horsebox", offering a third opportunity to eat and drink. When the Kelpies were first completed, the surrounding area was pretty raw and there were no facilities for non-boating visitors. At that time the presence of the M9 Motorway, however well screened, along the east of the site seemed intrusive, as did a line of pylons and high tension electricity cables to the west. Once the area had a chance to settle in and the grass to grow, these seemed to fade much more into the background. 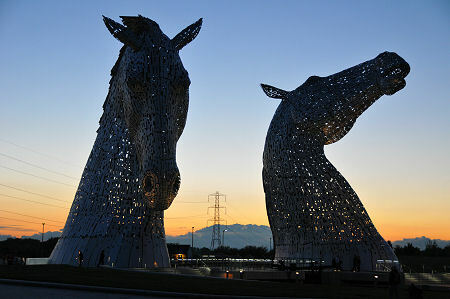 Visit on a summer's day and it is easy to see why the Kelpies and the Helix have proved so popular with local residents and visitors from further afield. The story of the Kelpies themselves began in around 2006, when British Waterways was looking for a way to make a landmark statement. The idea of horses flowed from the role that horses traditionally played in towing canal barges in the days when the canals were central to the growth of industry in central Scotland. 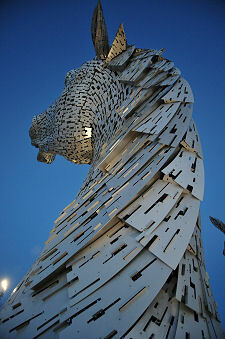 The name came from the mythical Scottish water creature that was said to be able to take the form of a horse. 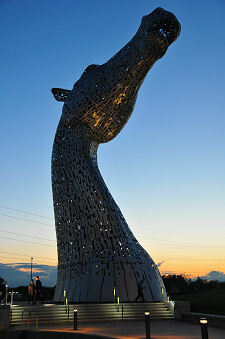 The artist chosen was Andy Scott, a man with a proven track record in large sculptures, often of horses. 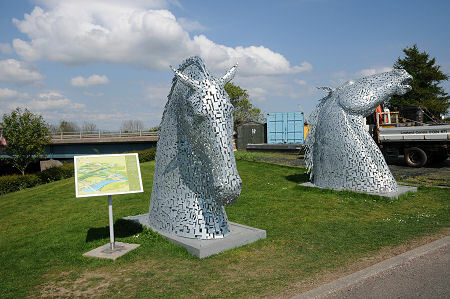 The two Kelpies were modelled on two real horses. Duke and Baron were Clydesdale horses employed by Glasgow City Council to transport visitors and goods around Pollok County Park. Duke became the model for the "head-down" Kelpie, while the slightly larger Baron modelled for the "head-up" Kelpie. Clydesdales were the breed of horse often used on canals, so it is appropriate that two of the breed formed the basis for the Kelpies. The first time the Kelpies were realised in three dimensions was in 2007, when two 1:10 scale "maquettes" were constructed. These were displayed on site, and also went on tour, appearing far afield as in New York. The Kelpies you see today were constructed during 2013. The statistics are fairly impressive. 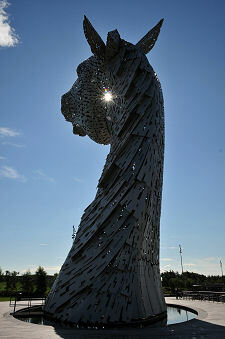 The finished Kelpies are 30m high, and consumed 150 lorry-loads of materials. They comprise a tubular steel skeleton, covered by 928 individually shaped stainless steel plates (over the two heads). 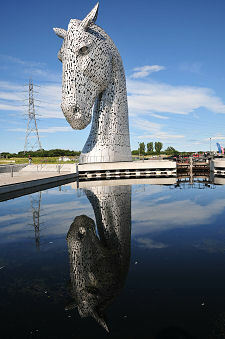 Each Kelpie weighs 300 tonnes, and each stands on steel-reinforced concrete foundations weighing 1,200 tonnes. 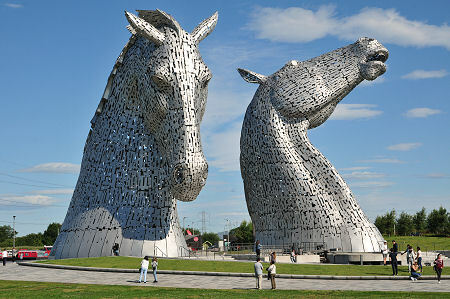 They cost £5m to build, and the result is the largest equine artwork in the world, and the largest public artwork in Scotland.